Believe: I believe that staying positive will help control the course of my Parkinson’s. I believe that having courage will provide worth in the battle against my Parkinson’s. I believe that being persistent allows me to restrain my Parkinson’s. I believe that if I don’t ever give up I can master the progression of my Parkinson’s. I believe that if you pity me it feeds the hunger of my Parkinson’s. I believe that if you join my team, you can help me stymie the slowly evolving pace of my Parkinson’s. Finally, I believe that frequent exercise will enrich my life while living with Parkinson’s. Parkinson’s is a movement disorder: The most common symptoms of Parkinson’s include rigidity; slowness of movement (bradykinesis); postural instability and gait problems; and resting tremor. Exercise and Parkinson’s: Exercise is good for everybody. In general, exercise reduces stress, builds muscle mass, improves flexibility, aids mood and sleep, and increases oxygen movement through the body. Exercise is crucial for anyone with Parkinson’s, absolutely essential. In Parkinson’s, you can imagine the general benefits of exercise; now add improving and enabling your flexibility, balance, strength, coordination and gait. 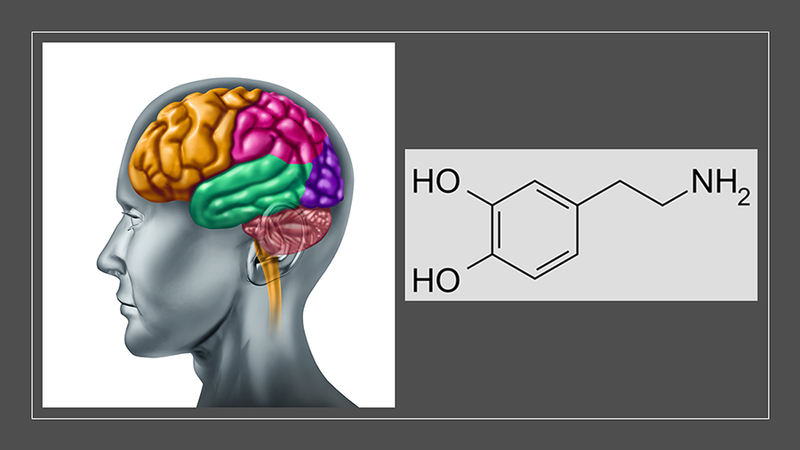 Exercise is also neuroprotective in Parkinson’s (see: http://www.ncbi.nlm.nih.gov/pmc/articles/PMC3136051/ and http://www.neurology.org/content/77/3/288 and http://www.ncbi.nlm.nih.gov/pubmed/21375602 ). Most internet-based searches mention bike riding, walking, dancing, boxing, yoga, and Tai Chi for the benefits of exercise in Parkinson’s. Personally, I would add both golf and tennis to this list of helping someone with Parkinson’s. 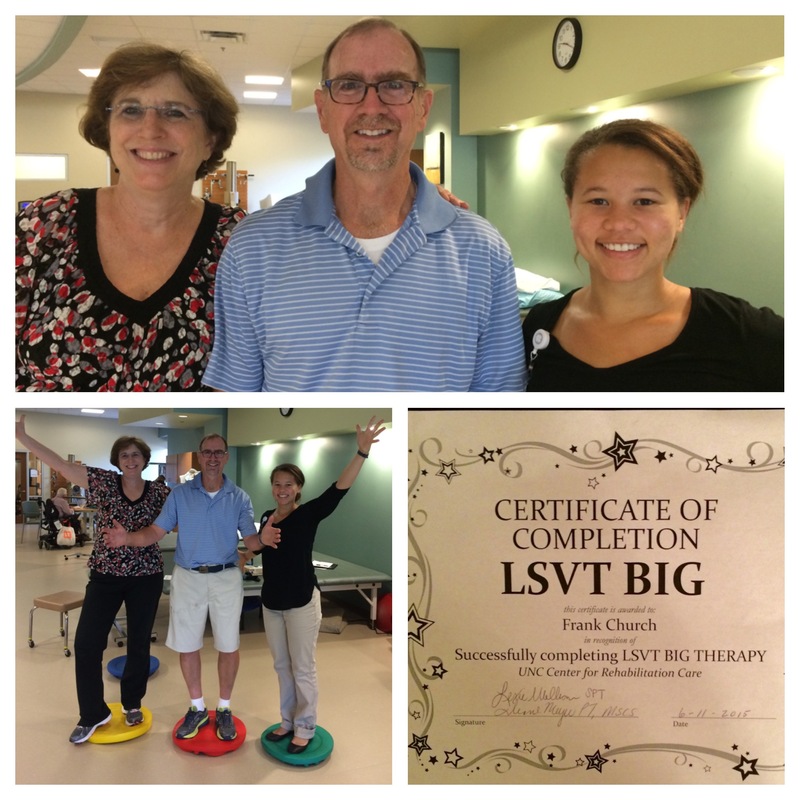 LSVT BIG physical therapy (PT) for Parkinson’s: The overall goal of LSVT BIG is making big movements. Neuroplasticity is reinforced in LSVT BIG from the repetitive and rigorous PT [“Neuroplasticity allows the neurons (nerve cells) in the brain to compensate for injury and disease and to adjust their activities in response to new situations or to changes in their environment.” http://www.medicinenet.com/script/main/art.asp?articlekey=40362 ]. LSVT BIG includes repetitive physical exercises that simultaneously engages everything from your fingers to toes, and all parts in between (arms, legs and your core). Go here for more information: http://www.lsvtglobal.com/patient-resources/what-is-lsvt-big and http://www.onthegophysio.co.nz/lsvt-big.html (LSVT = Lee Silverman Voice Treatment). The diagram below shows the needed effort of an individual with Parkinson’s to approach ‘normal’. LSVT BIG provides a foundation for (re)training an individual to have better posture, better flexibility, better movements, and better balance: The basic exercises begin with two Multi-directional Sustained Movements, Floor to ceiling stretch in sitting, and Side to Side stretch in sitting. Purpose of these exercises: Sustained muscle activation and active stretching. Next, there are five Multi-directional Repetitive Movements, Step and Reach (3) Forwards, Sidewards and Backwards; Rock and Reach (2) Forward/Backward and Side to Side. Purpose of these exercises: Differentiating starting and stopping, changing directions, sequential endurance, balance, and strengthening. The final two exercises are Sit to Stand and Walking Big. The Program is 60 min/day for 4 days/week for a total of 4 weeks. The repetitive nature, the intensity, and the homework are all aimed at re-programming your neural network to accentuate bigger movement. 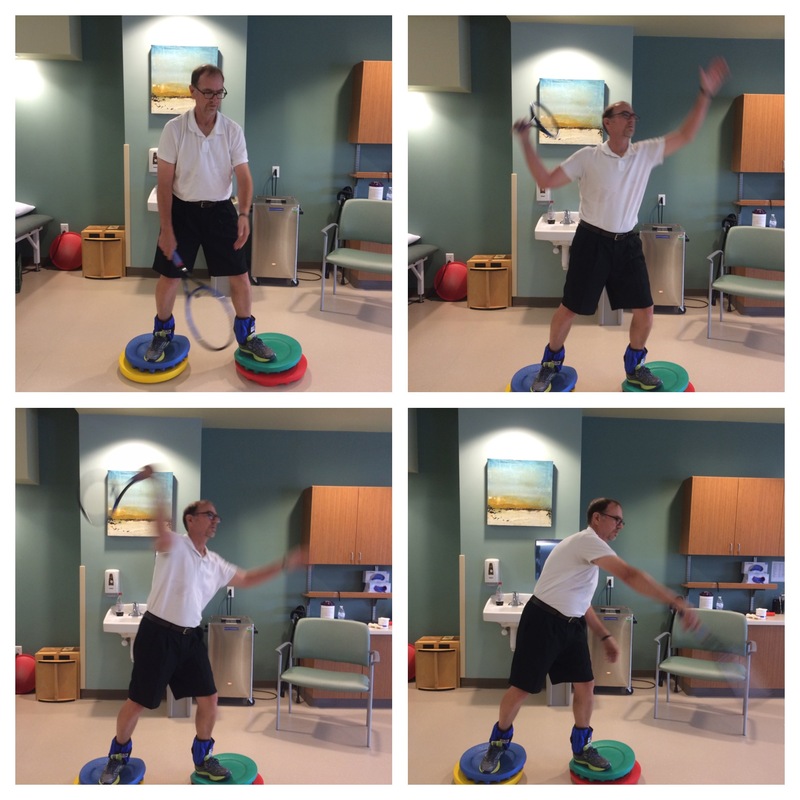 Bigger movement from a Parkinson’s patient will translate into more normal movements. 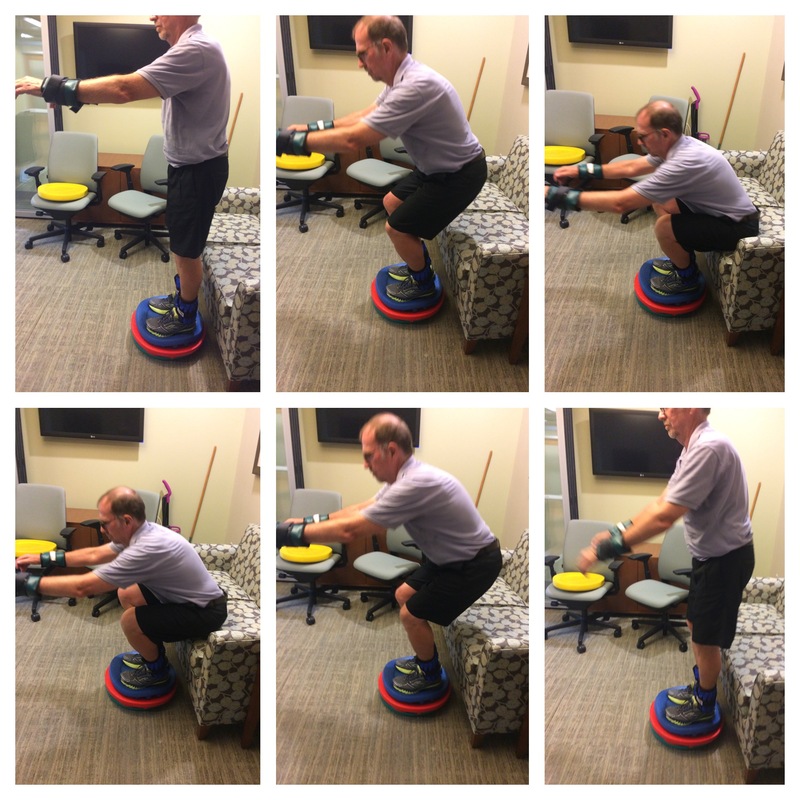 The challenge of my LSVT BIG program: To challenge me along the way, my PT’s devised obstacle courses, timed-trials, had me wear wrist and ankle weights, use a trampoline, and even do exercises while balancing on CanDo® Instability Pads. They devised exercises for me using a golf club and tennis racket. 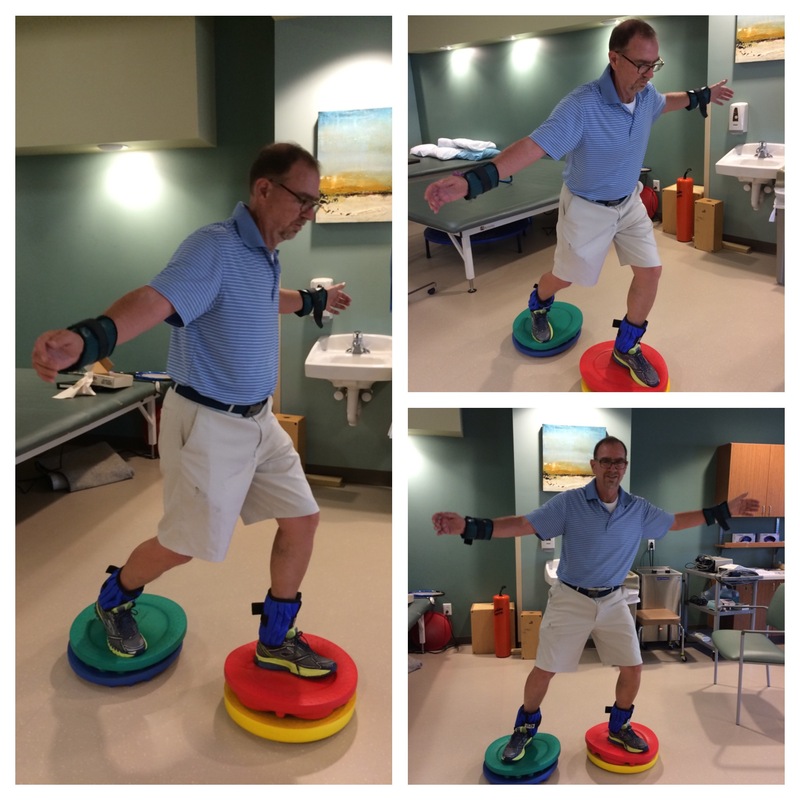 They tested my vestibular system (inner ear/balance) by doing exercises with my eyes closed while balanced on CanDo® Instability Pads, and then by standing only on one leg. I was fully drenched in sweat 20 mins into each session, it was such rigorous and grueling fun. And on your own as homework, you repeated the Program later each day (including the weekends). Included at the bottom are photos of some of my exercises. 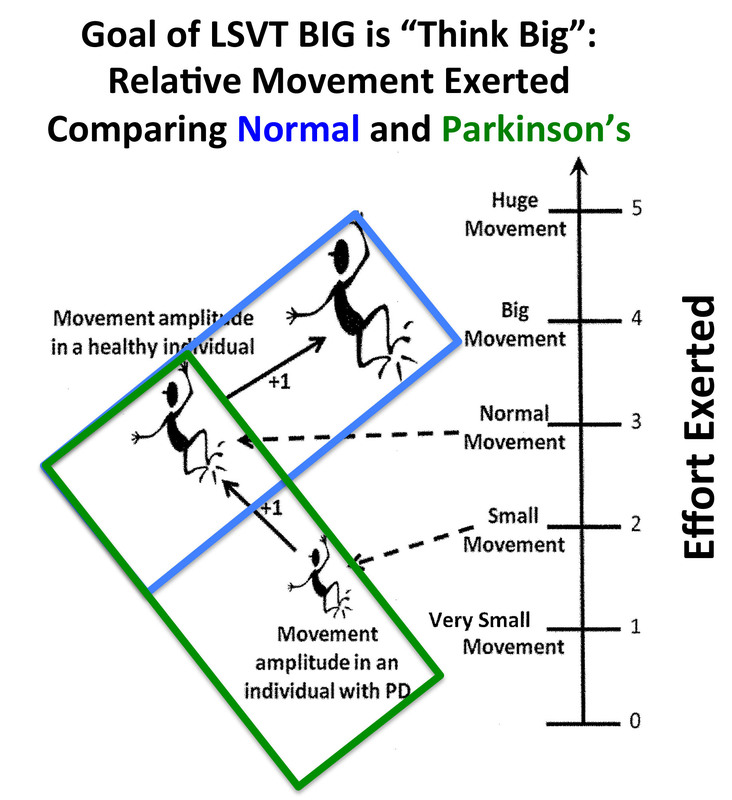 LSVT BIG results: As I’ve remarked before, Parkinson’s feels as if the ‘gyroscope gizmo’ we were born with, and used successfully for 50-something years for balance and walking and posture, is now out-of-whack and much less trustworthy. 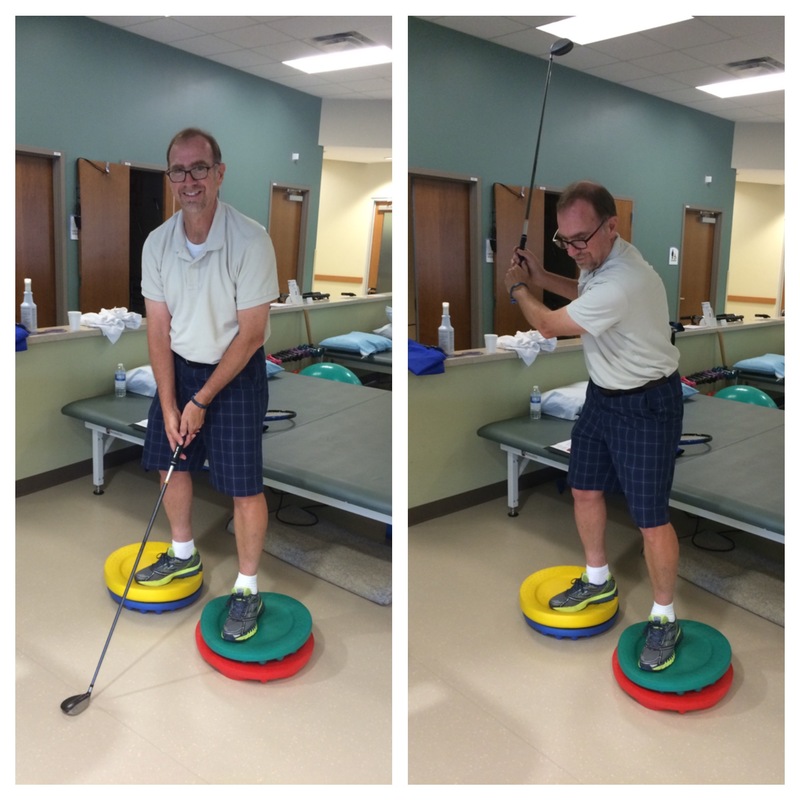 Some of my goals for LSVT BIG included: improve my entry/exit to my little car; add stability to every day life tasks; increase range of motion; better control going up and downstairs; improve the task of buckling my car seat belt; walking a golf course again; and hit a golf ball better. I achieved (improved) all 10 of my goals. Notably, I’m now walking 18 holes on a golf course; and recently I shot an 88 (44/44) for 18 holes where for the past year or so I’ve averaged between 95-98 strokes for 18 holes. I am very pleased with all of these positive changes. Ultimately, my goal is to continue my exercising to sustain these results. Acknowledgement: My successes above were made possible by Diane Meyer, an amazing PT, and Lexie Williams, an awesome Doctor of Physical Therapy Candidate. They devised my daily (and challenging) LSVT BIG Program, they pushed me constantly to improve my form/technique, and they were my daily taskmasters/cheerleaders always there with positive reinforcement (“Think big Frank!” and “Get big Frank!”). I definitely worked hard, but I succeeded because of Diane and Lexie, thank you so very much!